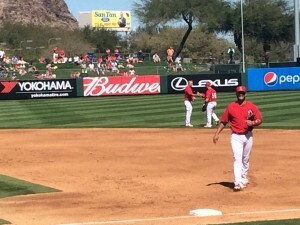 TEMPE, Ariz. >> Angels pitcher Matt Shoemaker was feeling calm as he warmed up for Sunday’s game against the Kansas City Royals on a warm afternoon in the desert. Then a bee buzzed around his head. “(Erick) Aybar yelled ‘Shoe there’s a swarm coming!’ That’s when I ran off the field,” Shoemaker said. 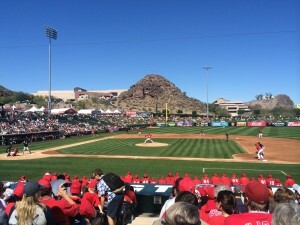 The swarm migrated like a tornado from left-center field at Tempe Diablo Stadium to the protective netting behind home plate. It finally settled on the “shotgun microphone,” perched high up in the net, used to pick up the crack of a bat for radio and television broadcasts. After 10 minutes Shoemaker warmed up again and the umpires allowed the game to begin. The bees had the best seat in the house. Jared Weaver started for the Angels on Friday, and allowed two hits in 2-2/3 innings against the Colorado Rockies. 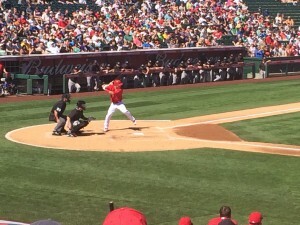 TEMPE, Ariz. >> On his first day of spring training, Angels outfielder Mike Trout identified two ways he would try to improve on his MVP season. One was to pump up his career-low 16 stolen bases; the other was to decrease his American League-leading 184 strikeouts. 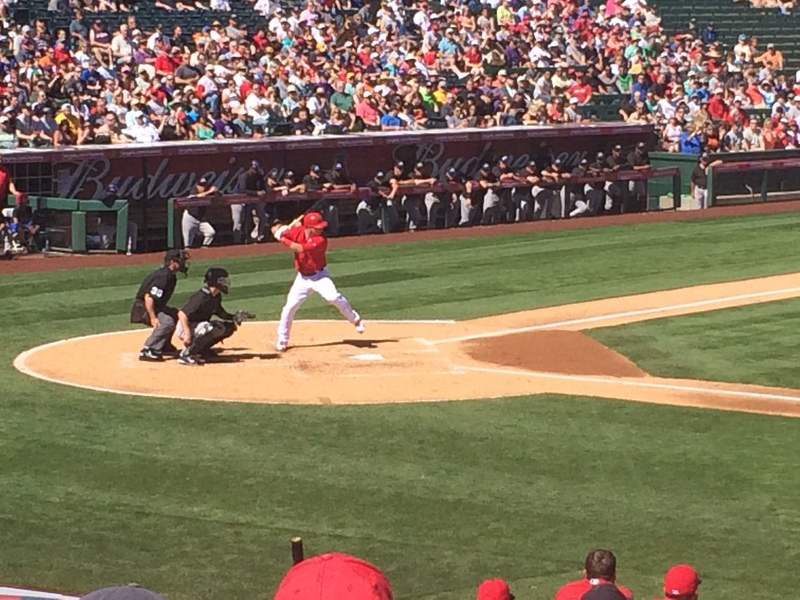 Trout backed up his words in his first Cactus League game on Thursday. He swung at the first pitch he saw from Kyle Lohse and flew out to deep right-center field. He later added a generously scored infield single — not on the first pitch — to finish 1 for 2. “I’m looking to drive the ball a little bit,” he said. “That’s the biggest thing for cutting down the strikeouts, is getting a pitch early in the zone to drive. I’ll work on it definitely this spring.